Two new gas tankers have been christened by Imperial Logistics, and will join the fleet that operates from the German city of Duisburg, which is the world’s biggest inland port. The state-of-the-art, energy-efficient vessels will be used to transport liquefied petroleum gas (LPG) and pressurised gaseous products, among other things. More than 100 guests attended the christening of the new tankers, which have been dubbed “Imperial Gas 92” and “Imperial Gas 93”. The vessels are 110 metres long and 11.45 metres wide, and they each have a capacity of 2 856 cubic metres. “They are each powered by two engines, and each tanker has six load tanks. 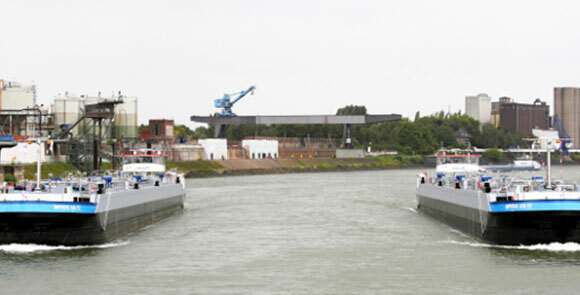 Because the gas tankers are suitable for operations on canals and secondary inland waterways, they can be used in the complete river Rhine area, including its tributaries. The new units will replace two older gas tankers from the fleet that will now be decommissioned,” Rossouw expands. “Gas tankers are a flexible solution for supplying energy and raw materials to industries, and an alternative to transporting liquid gases in pipelines. Gases have to be liquefied before they are transported. The reduction in volume resulting from this enables the vessels to accommodate greater loads. This means that inland waterway vessels have become a very efficient and eco-friendly means of transport,” Rossouw concludes. Imperial Logistics currently operates 17 gas tankers and has over forty years of experience in the gas tanker shipping sector – one of the few providers in Europe that ships gases liquefied under pressure via inland tankers. Imperial Logistics is also the only European inland shipping company that meets Tanker Management Self-Assessment (TMSA) on level 2.